Cinematic Media Theory and Practice. For over a year now, Integral Cinema Project Lead Researcher Mark Allan Kaplan has been producing a groundbreaking monthly article series at Integral Life: the much-acclaimed Integral Cinema Studio. In this remarkable exploration, Mark walks us through all of the main elements of Integral theory—using some of our favorite movies to illustrate the basics of the Integral approach, while noting how each of these elements has shaped the cinema experience since the invention of film itself. Not only does this series offer a wealth of perspective and insight to film, filmmakers, and audiences alike, but it also brings more color, more sound, and more awesome explosions to Integral thought and practice! Listen as Mark and Ken Wilber take an in-depth look at one of Integral Life's longest-running series, Integral Cinema Studio. This dialogue serves as a wonderful introduction to the major elements of integral theory. For those already familiar with the Integral model, this is a nice opportunity to both revisit your understanding of integral theory and to see how it can be applied to just about any interest, activity, or pursuit that you may have. 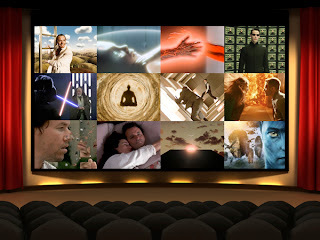 Either way, Integral Cinema Studio is a terrific way to deepen and enrich your own experience of film, simply by recognizing some of the deeper patterns and perspectives running through your favorite movies that you may not have recognized before. All of the elements of the Integral model are present in our awareness right now; Integral theory simply points to all the various aspects and dimensions that shape our experience of this present moment. It's therefore no surprise that we can see all of these elements reflected in various characters, conflicts, and stories throughout the history of film. Of course, whether the film-makers themselves actually intended this, or just intuited it, is another question—and to some degree inconsequential to the beauty and profundity we experience when these ideas and perspectives come to life on the big screen. What's more, this discussion and blog series promises to inspire a whole new generation of writers and filmmakers. It's not just how you express these perspectives, ideas, and insights—Integral Art does not require you to represent all quadrants, all levels, all lines, all states, etc. in your work (though all of these elements are implicitly present in every piece of art). Rather, it's about whether you are able to account for all of these in your own awareness, thereby allowing you to draw from a far richer, more colorful, and more comprehensive pallet of human experience. So grab a snack from the concession stand, turn off your phone, and enjoy this groundbreaking discussion between Mark Allan Kaplan and Ken Wilber! In the early part of the 20th century Swiss cultural philosopher Jean Gebser discovered different structures of human consciousness reflected in various cultures and observed a relatively new emerging structure of consciousness that he eventually termed “Integral.” Gebser detected this new form of consciousness or cultural worldview in many of the scientists, writers, and artists of the early 20th century. He discerned that this new worldview consisted of the transcendence of ego-centered perception and thought, and the realization that the three dimensions of space are relative to the fourth dimension of time, thus producing an aperspectival, or multi-perspectival, time-space transcendent form of consciousness (Feuerstein, 1987). This new form of consciousness, expressed through the arts appeared to include structures in which “time is no longer spatialized but integrated and concretized as a fourth dimension” (Gebser, 1985). For Gebser, this type of visually concretizing time along with the three-dimensions of space is an essential quality for any work of art to be considered integral because “the concretion of everything that has unfolded in time and coalesced in a spatial array is the integral attempt to reconstitute the ‘magnitude’ of man from his constituent aspects, so that he can consciously integrate himself with the whole” (Gebser, 1985). In addition to the concretion of time, Gebser (1985) also considered the concretion of interiority, or individual and collective interior dimensions, to be a precondition of the integral structure because “only the concrete can be integrated, never the merely abstract” (Gebser, 1985). 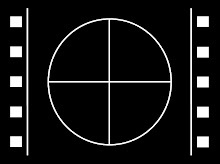 Films like Groundhog Day (1993) and Source Code (2011) are clear examples of the concretion of time or the concrete narrativization and visualization of temporal patterns in cinematic works; and films like The Matrix (1999) and Inception (2010) powerfully concretize interior dimensions of mind through text, image, and sound as well. While Dulac’s theoretical writings and public discourses on integral cinema mostly focus on this definition, her films reveal two distinct types of cinematic approaches. Whereas some of her films did seek to explore pure visual music approaches of using cinematic imagery, movement, and rhythm to reveal the interior life, films like her 1928 classic, La Coquille et le Clergyman (The Seashell and the Clergyman), reveal the raw beginnings of a more comprehensive or “integral” approach that attempts to use the inherent language of the cinema to capture and express the interior and exterior lives of both the individual and the collective. 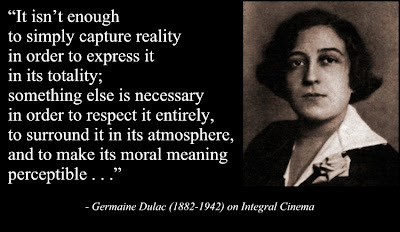 Dulac hints at this approach when she writes, “It isn’t enough to simply capture reality in order to express it in its totality; something else is necessary in order to respect it entirely, to surround it in its atmosphere, and to make its moral meaning perceptible…” (Dulac, as cited in Flitterman-Lewis, 1996, p. 49). This more comprehensive approach hauntingly captures some of the constructs of Jean Gebser’s integral worldview (1985) and Ken Wilber’s Integral Theory (1995) while predating both by 21 and 67 years, respectively.